Make your travel experience more immersive than never before! If you enjoyed "World Explorer" you will be amazed by this version: it’s RICHER and it adds many ADVANCED FEATURES. Browse 850.000 points of interest everywhere in the World. Get MANY LOCAL DATA such as the weather (temperature, wind speed and direction, humidity), local time, sunrise and sunset times and altitude, as if you were there. Locate places more easily with augmented reality! Hold your iPhone or iPad as if you were taking a photo and "World Explorer 360" will show on the screen, in real time, where the points of interest are, depending on the direction you’re looking at! Make it simple! Want an overview of any region of the world? Launch a slideshow on-the-fly and admire the most beautiful and interesting places around, with accurate explanations for each place! Want to discover the world like never before? 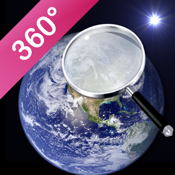 Get World explorer 360 at a special launch price!